Get Access to All Certification Exams Questions with Huge Discount! These Mega Packs are best suited for Institutes or Corporations that want to buy questions and practice exams for multiple certification exams, with a discount. 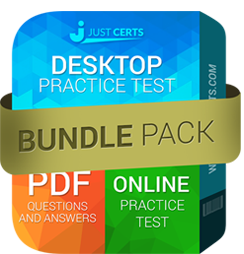 With these Packages you get our PDFs and Practice Exams Software for all the exams. Also we will provide you free updates to the products for your subscription duration. Free Updates comes with many benefits like New Software features and Latest Question sets for certifications exams.